A sweet guide to purchasing the perfect chocolate enrober! Before you purchase a chocolate enrober let Kinnek do the hard part. Submit a free request for quotes and we'll get multiple manufacturers to provide you with offerings and pricing for whatever your supply needs - all in one place! Chocolate enrobers can coat almost anything you can imagine with a solid, uniform, chocolate layer, saving significant manual labor and turning ordinary snacks into chocolate covered confections. The following guide offers an introduction into the marketplace for enrobers, detailing different sizes, capacities, and prices to help you make the right choice. How does the chocolate enrobing process work? First, chocolate is placed in the tempering system, which melts the chocolate so it reaches a smooth, liquid state. 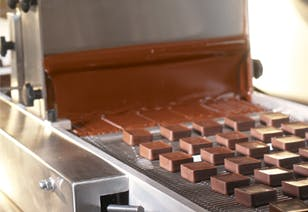 The tempering system is connected to the enrober to supply the liquid chocolate for the enrobing stage. The tempering machine usually comes with an enrobing line but can be bought separately and connected to the enrober. Next, the candy, fruit, pretzel, etc. is placed on a wire rack that carries the item through the prebottomer, which evenly coats the bottom of the item. Prebottomers can also be purchased separately and attached to an enrobing line (to learn more about prebottomers check out this Q&A). The wire rack then carries the item towards the enrober, passing through a preliminary cooling conveyer that helps solidify the chocolate applied by the prebottomer. The conveyer carries the product towards the coating pumps, which create a continuous chocolate waterfall that covers the item. These coating pumps perform the actual enrobing of the item. The chocolate that does not end up on the product drains through the wire rack. Many machines have chocolate return systems that cycle the unused chocolate back into the tempering unit. Most high quality machines will come with a tail cutter that removes the chocolate tail left by the enrober. The chocolate covered pieces are transferred on to wax paper so they can be easily removed after cooling. For certain types of confections, product toppers are used to sprinkle toppings such as sprinkles, cookie crumbs, or nuts onto the product. The chocolate-coated pieces then get carried to the cooling tunnel, where the chocolate is solidified and exits ready for packaging. The cooling tunnel is a long, insulated tunnel kept at a constant, low temperature, and plays an essential role in the outcome of the enrobed product. Precise temperatures in the cooling tunnel will produce a hard, glossy finish and optimal shelf-life. For those machines that don't have a cooling tunnel, the chocolate covered pieces are manually transported to a refrigeration system for cooling. What sizes / types of enrobers are available? Generally, the body of the enrober is made from stainless steel to minimize contamination. Enrobers come in a wide array of sizes, ranging from industrial sized machines – with over 100" belts that process thousands of items per hour – to much smaller machines, with belts as narrow as 6". Generally the wider the belt, the higher pieces per hour output (PPH) the enrober will generate. The enormous selection of sizes allows users to find an enrober that best fits their production needs. Suppliers usually offer a large selection of enrobers, customized for industrial production, large scale production, medium scale production, or small scale production. Sometimes the supplier will market certain enrobers as better for producing certain kinds of products. For example, there are machines specialized for enrobing cheese with wax, machines specialized for enrobing frozen or chilled products, machines specialized for ‘mounds’ of chocolate (with precise, temperature-constant air for eliminating excess chocolate), among many others. Some suppliers may also offer additional customizations for their core enrober machines. You pay extra to gain certain additional capabilities. For example, there may be an option to get an enrober with a removable stainless steel rack for easy cleaning. This could prove useful, especially if your business is tight on labor. Enrober capability is quite diverse, so be aware of all your options, and before discussing these different options with suppliers, try to prioritize your needs first. For example, some machines come with cooling tunnels, which allow for greater product throughput and enables a higher production ceiling, while some machines come equipped with double curtains to guarantee better total coverage. Consider your business’s specific requirements, both present and future, before moving forward with your purchase. How can the user control the quantity of chocolate being used and the speed of the conveyor? Most enrobing lines come with a single control panel that allows the user to precisely monitor the quantity of chocolate pumping through the coating pumps, determine the exact speed of the conveyer, and monitor the temperature of the chocolate in the temperer. Chocolate enrobers are often made exactly to the buyers liking, as certain components can be added or removed and belt widths can be customized. In most cases, buying an all-in-one enrobing line will save the buyer significant time and money. An entry level, all-in-one enrobing system will likely cost around $15,000. Generally such an enrobing line would not have the fancier features such as vibrating tables, blowers, or product toppers. Larger, industrial-sized enrobing lines can run over $100,000. For some, however, only specific parts of the enrobing process are needed. When buying individual parts of an enrobing line, the buyer must make sure the new parts are compatible with the existing system. What Type of Commercial Mixer Should You Purchase for Your Business? There are a variety of commercial mixers on the market today, so it's important to consider all your options before committing to a purchase. Maintaining a commercial convection oven isn't particularly complicated, but you should keep certain things in mind. What you need to know to prevent cross-contamination in your food operation.